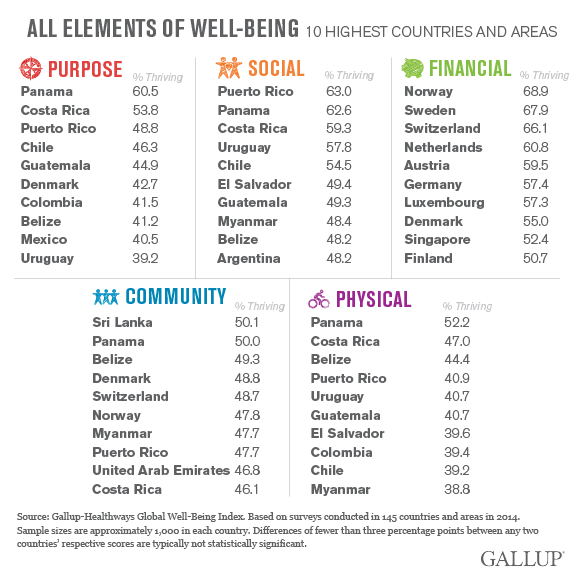 This article is the first in a series exploring worldwide perceptions of well-being in the five well-being elements of the Gallup-Healthways Global Well-Being Index: purpose, social, financial, community and physical. WASHINGTON, D.C. -- About one in six adults worldwide are considered thriving -- or strong and consistent -- in at least three of the five elements of well-being, as measured by the Gallup-Healthways Global Well-Being Index in 2014. Residents of the Americas region are the most likely to be thriving in three or more elements (31.3%), while those in sub-Saharan Africa are the least likely (10.2%). In analyzing the results of the index, Gallup and Healthways classify responses as "thriving" (well-being that is strong and consistent), "struggling" (well-being that is moderate or inconsistent), or "suffering" (well-being that is low and inconsistent). For the second year, Panamanians have the highest levels of purpose well-being (60.5% thriving) and physical well-being (52.2% thriving). They also tie with other countries for the top spot in social and community well-being. Factors contributing to this peak level of global well-being may include Panama's Latin American cultural predisposition that is associated with higher levels of positivity than other regions. Its relative political stability, a strong and growing economy in 2014, and investments in national development may also be contributing factors to higher levels of well-being in Panama. Gallup and Healthways' research shows that people worldwide with higher well-being are healthier, more productive and more resilient in the face of challenges such as unemployment. "Through scientific and peer-review research, we know that improving a population's well-being has a significant impact on increasing performance and lowering healthcare costs. 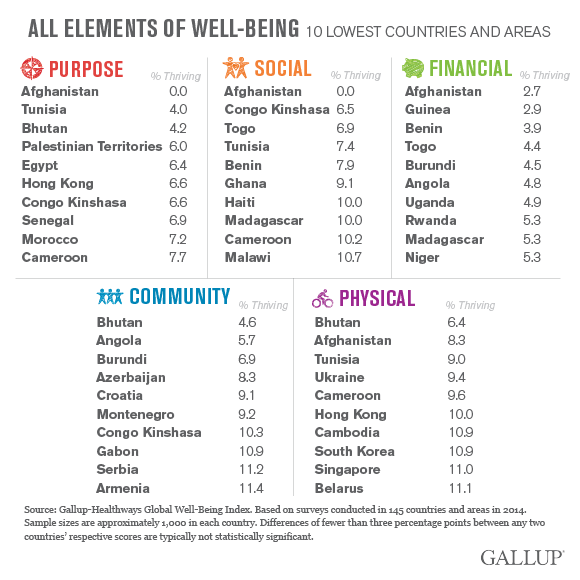 The fact that only about 17% of the adults Gallup surveyed are thriving in three or more elements of well-being underscores that many countries struggle to achieve high well-being. This represents a huge opportunity for country and community leaders, employers, insurers and any population health stakeholder. There are proven interventions that these leaders can and should leverage to improve the health and well-being of their population and, at the same time, create measurable economic value," said Peter Choueiri, president of Healthways International. Subjective well-being does not necessarily correlate with GDP, the presence of conflict or other absolute indicators. War-torn populations such as those in Afghanistan may have extremely low well-being, but Gallup and Healthways also found low levels of well-being in countries that are relatively stable, such as Croatia, South Korea and Singapore. 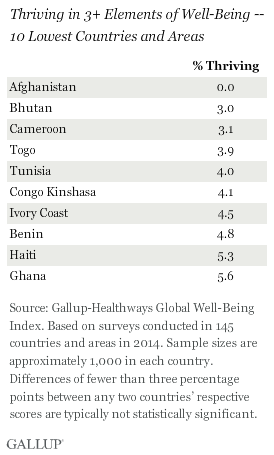 The 2014 Gallup-Healthways Global Well-Being Index results have policy implications for country leadership, development organizations, employers, health insurers (private and governmental) and others. 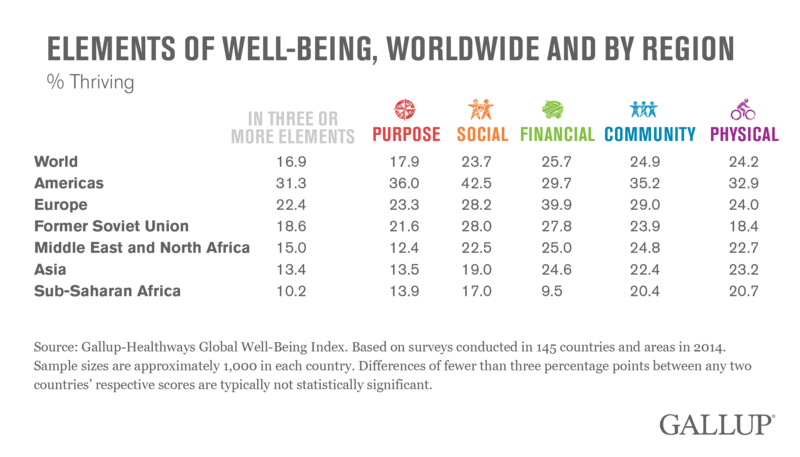 Leaders can use the Global Well-Being Index to establish a baseline for well-being, benchmark their populations, determine where gaps exist in essential services or opportunities, prioritize and implement interventions, and, ultimately, understand the effects of their investments. Results for the Gallup-Healthways Global Well-Being Index are based on telephone and face-to-face interviews on the Gallup World Poll, with a random sample of more than 146,000 adults, aged 15 and older, living in 145 countries and areas in 2014. 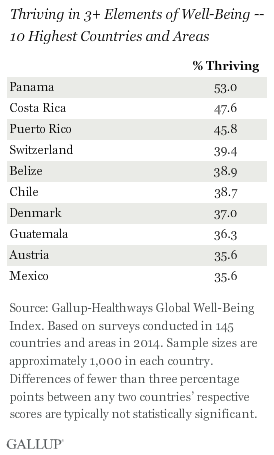 Learn more about how the Gallup-Healthways Well-Being Index and Gallup World Poll work.